Modi also took a jibe at Abdullah over his recent remark over a separate PM for Jammu and Kashmir. “Some are threatening of two prime ministers, some are speaking the language of anti-nationals but I want to make it clear that Jammu and Kashmir is an integral part of India and their ‘vanshwaad’ [dynasty rule] will not survive for long,” he said. Prime Minister Narendra Modi said on Sunday the Bharatiya Janata Party (BJP) was riding a wave stronger than the support it received in the 2014 Lok Sabha elections, while also attacking the two main parties in Kashmir during his campaign for the second phase of polling. Modi was in Jammu and Kashmir’s Kathua to campaign for Union minister and the BJP’s Udhampur Lok Sabha candidate Jitendra Singh. Voting will be held for the constituency on April 18. “I have visited the entire country… I have seen a more powerful wave this time as compared to 2014,” Modi said. He said that opinion polls and surveys showed the BJP was set to win three times the seats that the Congress was projected to get. The Prime Minister blamed two political families of Kashmir – one of National Conference leader Omar Abdullah and the other of Peoples Democratic Party chief Mehbooba Mufti – for “ruining” three generations in the state and said he will not allow them to “divide” the country. “These families have sucked the blood of people of J&K for long and I challenge them – let them field all their relatives in the polls, abuse me as much as they can, but I will not allow them to succeed in their nefarious design of dividing India,” he said after starting his speech in the local Dogri language. Abdullah questioned why the BJP made two members of the Mufti family chief ministers. “‘We have to rid J&K of these two political families,’ says Modiji in 2014 and then promptly goes and makes not one but two members of the Mufti family CM of J&K,” Abdullah tweeted. Launching an attack on the BJP, Mufti said leaders of the party “are suffering from the disease of fear”. At another rally in Uttar Pradesh’s Moradabad, Modi renewed his attack on the Congress and other opposition parties over the issue of national security. “What used to happen earlier was terrorists would come from Pakistan, attack us and the Congress government would only lament before the world that we have been attacked. But in this new India when terrorists attacked Uri, our brave soldiers conducted a surgical strike,” he said. “The second big mistake the terrorists made was in Pulwama after which we killed them in their home through air strikes,” Modi added, referring to the air strike on a terrorist camp in Pakistan’s Balakot after a February 14 suicide bombing in Kashmir killed 40 troopers of the Central Reserve Police Force (CRPF). He added that the Congress did not have faith in India’s armed forces. The PM said that wrong policies of the Congress led to the mass exodus of Kashmiri Pandits from the Valley in 1989. In Aligarh, Modi raised the issue of nationalism, a key plank of the BJP’s outreach to voters. “They [Samajwadi Party-Bahujan Samaj Party] have fielded such candidates in this election who have reservation over Vande Matram. Those who cannot respect Vande Matram, cannot respect mother India. Their (SP-BSP) thinking is only one – abuse Modi as much as they can,” he said. The Prime Minister also launched an attack on Punjab chief minister Amarinder Singh, saying he did not get time to attend the government’s Jallianwala Bagh event with vice president Venkaiah Naidu as he was busy with “parivar bhakti”, an oblique reference to the Gandhi family. Responding to the allegations, Singh accused the PM of playing “dirty politics”. He alleged the central government had deliberately chosen to hold a “parallel event” instead of supporting the initiatives and programmes of the state government. “I had personally approached the Prime Minister several times over the last two years to seek support for ensuring that the centenary of the historic event is observed in a befitting manner but the central government had failed to respond suitably,” the Punjab CM said. He added that the PM was trying to mislead the people of the country with politically motivated falsehoods. Prime Minister Narendra Modi said Pakistan’s attitude towards India and that during the Congress government has undergone a sea change and terrorists and their sponsors in Pakistan are living in fear. Prime Minister Narendra Modi on Thursday said that in order to talk of peace it is essential to be strong as he came down heavily on the opposition, particularly Congress, over national security. At an election rally in Bhagalpur, Modi said that the country has emerged stronger after retaliatory action against Pakistan following the Pulwama terror strike. He said the air strike was carried out to address “the restlessness of 130 crore people of country for a firm and definite action against Pakistan”. He attacked the opposition alliance for “speaking the language that supports terrorism”. He stressed that the opposition alliance should clarify whether they are with terrorists or with armed forces. Modi who was campaigning for JD (U) nominees contesting as NDA candidates from Munger, Banka and Bhagalpur parliamentary seats, said the NDA has a clear policy of giving free hand to armed forces in the fight against terrorism and extremism. While he did not mention the Congress manifesto, he asked the people whether they approve curtailing power of the armed forces. The Congress manifesto promises to review the Armed Forces (Special Powers) Act which gives the forces in disturbed areas sweeping powers of search and arrest and provides immunity from prosecution in civil courts. He said as chowkidar of the people he has done what was expected from his government for social security and national security. He referred to works undertaken in social security front under various centrally sponsored schemes including Ayushman Bharat. He said opposition leaders were fighting for their existence and were trying their best to create fear among people that there would be no election in the country in future and that the reservation policy would be abolished if he is voted back to power. “On the contrary I favour further strengthening of reservation policy,” Modi said and cited the 10% reservation which his government had announced for poor people of upper caste. He referred to the government’s minimum support price agriculture produce of farmers against their crop expenditure and said the Congress had no interest in improving the lives of farmers. “Once we are voted to power again all farmers would be covered under financial assistance scheme instead of present coverage to farmers having land holdings up to five acres,” Modi said. He also spoke about future plans aimed at extending support to small and marginal farmers besides small businessmen. He mentioned the development work undertaken in Bihar praised Nitish Kumar’s government for its performance. In the silk town, the PM also spoke about the problems faced by local silk industry and apprised them on what his government has been doing to boost their business globally. “The mega handloom cluster was established here as a step towards solution of your problems,” Modi said. India Proves That Pakistan F-16 Was Shot Down: Pakistan Caught Lying Again! The IAF said there was more credible evidence available to establish that Pakistan Air Force had lost one F-16 in the air action. The Indian Air Force on Monday released radar images to rebut Pakistan’s claim that it hadn’t lost a US-manufactured F-16 fighter jet in the February 27 dogfight. The IAF said there was more credible evidence available to establish that Pakistan Air Force had lost one F-16 in the air action. But the IAF is restricting the information being shared in public domain due to security and confidentiality concerns, Air Vice Marshal RGK Kapoor, Assistant Chief of Air Staff (Operations) said. Officials said the Air Force also had evidence in the form of radio-telephony intercepts of the Pakistan Air Force F-16 strike package and ground wireless intercepts but would not place this evidence in public domain due to security and confidentiality concerns. Days after Pakistan sought to assert that the Indian Air Force hadn’t shot down one of its F16 fighter aircraft, the IAF released radar images as proof to expose the neighbouring nation’s claims. The fact is that the IAF had achieved its objectives of successfully striking the Balakot camp and thwarting the retaliatory PAF attack against Indian military installations that followed on February 27, Air Vice Marshal Kapoor said. It is believed to have been the first ever kill of an F-16 by a MiG-21 Bison, fighter jets of two different generations. Pakistan had, however, insisted that the PAF did not lose any fighter jet in the engagement over the skies of Nowshera in Rajouri district of Jammu Province, the first aerial dogfight between the two air forces since the 1971 Bangladesh Liberation War. Islamabad had also insisted that it did not use the US-made F-16 combat jets in the February 27 air action. Last week, however, there was a shift in Islamabad’s stand when Pakistan military said it had the right to use any aircraft for its self-defence. Prior to this statement, Islamabad had claimed that it had only used JF-17 Thunder jets, developed jointly with China, in the February 27 engagement with India and that its aircraft had shot down two Indian Air Force jets. India contested both points, saying it lost only one MiG-21 and that an F-16 was shot down. In the new statement, Pakistan military arm’s media wing said it was “immaterial” whether F-16s or JF-17s were used. It described the events of February 27 as “part of history now” and said no Pakistani F-16 “was hit by the Indian Air Force”. A report in the Foreign Policy magazine, however, waded into the row last week when it claimed that US defence personnel had recently conducted a physical count of Pakistan’s F-16s and found none missing. The US defence ministry spokesperson, however, told Hindustan Times that the department wasn’t “aware of any investigation like that”. Donald Trump signed a proclamation today (March 25) recognizing the Golan Heights as part of Israel, overturning 50 years of US precedent and defying international law on sovereign borders. That means that the world’s most powerful military has decided to support Israel’s 1967 occupation and 1981 annexation of a region that the rest of the world and the United Nations recognize as belonging to Syria. “Aggressive acts by Iran and terrorist groups, including Hizballah, in southern Syria continue to make the Golan Heights a potential launching ground for attacks on Israel,” Trump said, explaining the move. By ignoring the United Nations charter pledge to refrain from “the threat or use of force against the territorial integrity or political independence of any state,” Trump is putting the future of other long-disputed territory in jeopardy, foreign policy experts say. “It sets a terrible precedent,” said Edward Goldberg, a professor with New York University’s Center for Global Affairs. “If the US doesn’t recognize international law as the ‘cop,’ then who does?,” he said. Beijing considers Taiwan part of China, despite the fact that the island nation has an indigenous population, is self-governing, and has conducted independent democratic elections since the 1990s. Most other democracies around the world don’t recognize Taiwan as an independent country, in deference to China, and it is barred from the United Nations. While the United States has recently partnered with Taiwan officials to fight intellectual property theft, this January Chinese president Xi Jinping warned that Beijing could retake the island by force. The Kashmir region between India and Pakistan has been disputed for more than 70 years, a legacy of the Partition that accompanied Britain’s withdrawal from India in 1947. Tensions rose in the volatile region in recent weeks, after India conducted a “pre-emptive strike” in Pakistan-controlled territory, and Pakistan captured an Indian fighter pilot. The mostly Muslim residents of the India-administered Kashmir Valley view the national government as an occupying force, and Pakistan officials support their self-government. So far there are no signs that the Trump administration is interested in inserting itself into the long-simmering Pakistan-India dispute. However, the US Navy has increased its presence in the Taiwan Strait, most recently on March 24, responding to Beijing’s circling of the island in recent drills. Syria, Lebanon, Turkey, and the United Nations immediately condemned Trump’s proclamation, and the UN declared Israel’s annexation of the area “null and void.” As president, Trump has pulled the US out of international agreements, including the Paris Climate Accord and the TransPacific Partnership, but the Golan Heights decision is being specifically criticized as breaking international law. Stay updated about Quartz products and events. Bipin Rawat said the whole world was aware that terror camps in Pakistan-occupied Kashmir were being run by government agencies to cause disruptions in India and that all terrorism in Jammu and Kashmir was state sponsored. On a day Pakistan Prime Minister Imran Khan made a pitch for peace with India, army chief General Bipin Rawat said that Pakistan has used “hybrid warfare” against India since Independence and continues to do so. He cited the use of irregulars by the Pakistani army in 1947-48, 1965 and, most recently, in the 1999 Kargil war. Delivering the 9th YB Chavan Memorial Lecture at the Institute of Defence Studies and Analyses on Addressing the Challenges of Hybrid Conflict in the 21st Century, Rawat said each act of cowardice in Jammu and Kashmir would be responded to with vigour and no sacrifice made by soldiers would go in vain. Rawat said the whole world was aware that terror camps in Pakistan-occupied Kashmir were being run by government agencies to cause disruptions in India and that all terrorism in Jammu and Kashmir was state sponsored. General Bipin Rawat said hybrid operations last for a long time and the prime intent is to maintain deniability and that was what India was witnessing in Kashmir. “In the 21st century technological advancements have added greater asymmetry to hybrid warfare. Irregulars can surprise conventional forces with hi-tech gadgets and weapons such as rockets, surface-to-air missiles, sophisticated communication systems and near-instant reach back to their state sponsors,” he said. He said small but tech-savvy teams with intimate local knowledge and support could cause big disruptions. Underlining the risks of using hybrid warfare, he said instigators ran the risk of losing control of the choreographed plan and that states practicing this often fall victims to these same tactics. Responding to a question on whether India should go in for an offensive hybrid war, General Bipin Rawat said, “The stone that is thrown up comes and falls on your head…What happens to those people (the non-state actors) after the end state has been achieved?” Rawat advocated a calibrated offensive and defensive hybrid warfare strategy. Punjab CM Amarinder Singh cited terrorist attacks in his state and the killings of Indian soldiers by Pakistani armed forces. Punjab’s chief minister Amarinder Singh has declined an invitation by Pakistan Prime Minister Imran Khan to attend the laying of the foundation stone for the Kartarpur corridor on November 28, citing terrorist attacks in his state and the killings of Indian soldiers by Pakistani armed forces. In a letter to the Pakistan foreign minister Shah Mehmood Qureshi, Amarinder welcomed it as a “historic occasion”, which he also described as a “cherished desire of Sikhs around the world”, but said he would not be present for the ceremony across the border. “[Pakistan’s spy agencies] ISI has started its nefarious activities within Punjab and since my government was sworn in, in March 2017, the state neutralized 19 ISI armed and controlled modules, apprehended 81 terrorists and recovered 79 weapons, in addition to numerous grenades made in Pakistan’s ordnance factories,” said Amarinder, referring to last week’s grenade attack on a Nirankari religious gathering in Amritsar. Two people have been arrested in connection with the attack that killed three people. Police suspect the role of a Khalistani group backed by Pakistan’s Inter-Services Intelligence (ISI). “I hope the Pakistan Prime Minister will understand that in these circumstances it will not be possible for me to be present in Pakistan, despite the fact that paying my respects at Gurdwara Sri Kartarpur Sahib has always been a cherished dream which will hopefully be fulfilled once these hostilities are stopped,” added Amarinder, who received the invitation from Qureshi on the behalf of PM Imran Khan. But a minister in his state cabinet, Navjot Singh Sidhu, accepted the invitation “with unalloyed joy”. “As our nations take this first step, the Kartarpur Spirit can make pilgrims of us all, venturing out on a journey that breaks the barriers of history and opens the borders of hearts and the mind,” he wrote in his letter to Qureshi. Sidhu, on his last visit to Pakistan on August 18 to attend Khan’s swearing in ceremony, sparked a controversy after he hugged Pakistan Army chief General Qamar Javed Bajwa. As the Bharatiya Janata Party (BJP) launched an attack and the Punjab CM expressed unhappiness over his gesture, Sidhu justified his visit to Pakistan saying he went there as a messenger of peace and hugged the Pakistani army chief in an emotional response to the information provided by him that the neighbour country was working on the corridor to Kartarpur Sahib. On Thursday, both India and Pakistan agreed to build corridor on their respective sides, to commemorate the 550th birth anniversary of Guru Nanak Dev in 2019. Welcoming the move, Amarinder had said the move will facilitate pilgrims desirous of visiting Kartarpur gurudwara. But the next day the government lodged a strong protest with Pakistan after Indian diplomats were harassed and denied access to Sikh pilgrims visiting gurudwaras in Pakistan. Vice-president M Venkaiah Naidu will lay foundation stone in Dera Baba Nanak on Indian side on November 26. Amarinder will attend the function, in which his political rival Shiromani Akali Dal (SAD) will also be a present. Union minister of state Harsimrat Kaur Badal of the SAD will attend the ceremony on the Pakistan side along with Union urban development minister Hardeep Puri. The fact that pro-Khalistani posters, banners and slogans were raised near the holy shrines – Gurdawara Nanakana Sahib and Gurdawara Sacha Sauda – only added to India’s anger. India on Friday lodged a strong protest with Pakistan after Indian diplomats were harassed and denied access to Indian Sikh pilgrims visiting the neighbouring country to mark the start of celebrations of the 550th birth anniversary of Guru Nanak, which falls next year. The efforts to “promote secessionist tendencies” to undermine India’s sovereignty and territorial integrity is of “grave concern,” the ministry of external affairs (MEA) said in New Delhi. Refused access and prevented from entering the shrines, Indian diplomats returned to Islamabad without performing their diplomatic and consular duties vis-a-vis Indian pilgrims, the MEA said. This is the third time in a row that Indian diplomats in Pakistan have been harassed and not allowed to meet Sikh pilgrims citing security reasons, it said. The spat came just a day after New Delhi and Pakistan decided to develop a corridor on their respective sides of the border to let Sikh pilgrims visit the historic Gurdwara Darbar Sahib in Kartarpur on the banks of river Ravi in Pakistan. The incident is an indication of the fragile relationship between the two nuclear-armed neighbours. “It is not surprising that this happened. Pakistan is using Khalistan issue like before. Now, of course, with elements from Canada and the UK, Pakistan is trying to rekindle the issue. Pakistan provides support to these people in the gurdwaras, then prevents our diplomats from getting access to the gurdwaras and pilgrims,” said Kanwal Sibal, former foreign secretary. Recently, in Amritsar – another holy site for the Sikh faith – grenades were launched at a religious congregation, killing three people and injuring several others. Later, investigations by the Punjab police showed the grenades were Pakistani-made. The attack, Punjab police said, had been instigated by Pakistan’s spy agency Inter-Services Intelligence (ISI) and leftover pro-Khalistan elements sheltered by Pakistan. Interestingly, among those who prevented Indian diplomats was the controversial figure Gopal Singh Chawla, who has earlier been seen with Hafiz Sayeed of the Jammat-Ud-Dawa who is wanted in India for several terror strikes, including the November 26, 2008 Mumbai terror strikes in which 166 people were killed and over 300 were injured. “India has today lodged a strong protest with the government of Pakistan that despite having been granted prior travel permission by the Ministry of Foreign Affairs of Pakistan, the Consular officials of the High Commission of India in Islamabad were harassed and denied access on November 21 and 22 at Gurudwara Nankana Sahib and Gurudwara Sacha Sauda,” the MEA said in a statement. New Delhi also said that “Pakistan has been called upon to take all measures to not allow its territory to be used for any hostile propaganda and support for secessionist tendencies against India in keeping with the commitments made under the Simla Agreement, 1972 and endorsed in the Lahore Declaration, 1999.”. The Indian pilgrims are visiting Pakistan under a bilateral protocol. “Pakistan has been reminded that such actions are not in consonance with the stated intentions of Pakistan to facilitate the visits of Indian Sikh pilgrims, especially as we commemorate the 550th Birth Anniversary of Guru Nanak Devji,” the MEA said. The MEA called the denial of access an attempt to deflect attention from Pakistan’s violation of international legal instruments and conventions like the Vienna Convention on Diplomatic Relations and the Vienna Convention on Consular Relations. Pakistan has been reminded that this is in contrast to the treatment meted out to their high commissioner and the consular officials in New Delhi who have been provided full access to meet the Pakistani pilgrims who are currently in India on a pilgrimage to Kalyar Sharif, the MEA said. The plan to build a corridor on the Indian side leading to the border near the gurdwara was among a slew of proposals cleared during a Cabinet meeting to mark Guru Nanak’s 550th birth anniversary in 2019. India and Pakistan announced on Thursday that they will build a corridor on their respective sides to let Sikh pilgrims visit the iconic Gurdwara Darbar Sahib in Kartarpur on the banks of the river Ravi in the neighbouring country. The plan to build a corridor on the Indian side leading to the border near the gurdwara was among a slew of proposals cleared during a Cabinet meeting to mark Guru Nanak’s 550th birth anniversary in 2019. The corridor on the Indian side will be built as an “integrated development project” with funding from the central government, and the Indian government called on its Pakistani counterpart to develop a similar corridor on its territory to “recognise the sentiments of the Sikh community”, said people familiar with the developments. “In landmark decision, the Cabinet approves building and development of Kartarpur corridor from Dera Baba Nanak in Gurdaspur district to International Border. Kartarpur corridor project with all modern amenities and facilities to be implemented with Central Government funding,” home minister Rajnath Singh tweeted minutes after the Cabinet meeting got over. President Ram Nath Kovind and Punjab chief minister CM Amarinder Singh will lay the foundation stone of the corridor on November 26, news agency PTI reported citing sources in the state government. “The move will facilitate lakhs of pilgrims desirous of visiting the Kartarpur gurdwara,” Amarinder Singh said in a statement. Bharatiya Janata Party (BJP) president Amit Shah and Shiromani Akali Dal chief Sukhbir Badal termed it as “historic”. Soon after the external affairs ministry sent a note verbale of formal communication to the Pakistani high commission in New Delhi regarding the issue, Pakistan’s foreign minister Shah Mehmood Qureshi said on Twitter that groundbreaking for work in his country will be done by Prime Minister Imran Khan on November 28. India’s outreach to Pakistan also marked the first formal contact between the two sides since New Delhi called off a meeting of the foreign ministers on the sidelines of the UN general assembly in September over terror-related concerns. It comes at a time when there has been a sharp uptick by pro-Khalistan groups in countries such as Canada, the UK and the US. There have also been reports of Pakistan allegedly backing some pro-Khalistan elements in western countries. “The Kartarpur corridor will provide smooth and easy passage to pilgrims to visit Gurdwara Darbar Sahib throughout the year. Government of Pakistan will be urged to reciprocate and develop a corridor with suitable facilities in their territory,” Singh said in another tweet. Briefing reporters, Union finance minister Arun Jaitley said the proposed corridor would have visa and customs facilities for pilgrims and would be equipped with modern amenities. Guru Nanak spent 18 years in Kartarpur and the decision to build this corridor was taken at a Cabinet meeting chaired by Prime Minister Narendra Modi, Jaitley said. The funds for the construction of the corridor will be provided by the Centre. There has been a longstanding demand from the Sikh community for the creation of a corridor to allow them to visit the gurdwara without visas. The matter returned to focus earlier this year when Pakistan Army chief general Qamar Bajwa told Punjab minister Navjot Singh Sidhu during Imran Khan’s swearing-in on August 18 that Islamabad had plans to open a corridor to the shrine for Indian pilgrims. An official in the PMO added that India expects that the corridor should be open 365 days and 24 hours and there must be no restrictions on the number of pilgrims that are travelling across the border. There must be free and readily available consular access for Indian citizens on the Pakistani side, added the official. The meeting of the Cabinet in New Delhi decided that Guru Nanak’s 550th birth anniversary would be celebrated by the central government along with the state governments and Indian missions abroad in a “grand and befitting manner”, the people cited above said. A committee led by the home minister will monitor and oversee these celebrations. On the Indian side, the corridor will be built from Dera Baba Nanak in Gurdaspur district of Punjab to the border, and it will have all modern amenities and facilities for the smooth passage of pilgrims. The Indian government wants pilgrims to be able to visit the shrine throughout the year, the people said. Officials in Islamabad said Pakistan had intended to discuss this matter at the meeting of the foreign ministers that was cancelled. 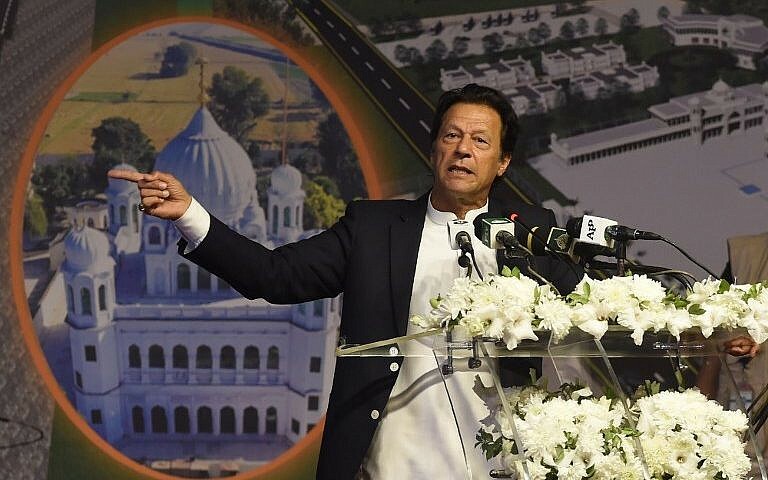 Against the backdrop of reports in the Pakistani media that the Imran Khan government had plans to start work on a corridor, people familiar with the developments in New Delhi said the Indian Cabinet’s decision was not in any way a response to any move contemplated by the Pakistani side. There are plans to develop the town of Sultanpur Lodhi, associated with the life of Guru Nanak, as a heritage location for tourists, the person said. Governor Malik dissolved the state assembly late on Wednesday night after claims for forming a new government were pressed both by Peoples Democratic Party (PDP) chief Mehbooba Mufti and People’s Conference leader Sajjad Lone. Home minister Rajnath Singh on Thursday distanced the Bharatiya Janata Party (BJP) from Jammu and Kashmir governor Satya Pal Malik’s decision to dissolve the state assembly, saying Malik acted after concluding that it wasn’t possible for a new state government to be formed in the current scenario. Governor Malik dissolved the state assembly late on Wednesday night after claims for forming a new government were pressed both by Peoples Democratic Party (PDP) chief Mehbooba Mufti and People’s Conference leader Sajjad Lone. Mufti said she had the support of PDP’s arch rival National Conference (NC) and the Congress, claiming the backing of 56 MLAs. Lone said he had the support of the BJP’s 25 legislators and “more than 18” other members in the 87-seat assembly. The home minister questioned Mufti’s claim of having secured the support of the Congress. “Congress leader Ghulam Nabi Azad has made a statement that suggests his party had not supported PDP’s bid to form the government. Why did he make that statement if Mufti was right,” Singh asked. Another senior government functionary claimed that the governor had been considering dissolution of the assembly for the “past three-four days” and there had been no pressure on him from the Centre or any leader to pre-empt Mufti’s bid to form government. “The governor, it looks, felt there was not a situation where any party had the numbers to form the government,” Singh said. The state has been under governor’s rule since June. The home minister rejected any notion that the BJP had been spooked by the fact that the PDP, the NC and the Congress had come together to stake a claim for forming a government in J&K. “Where does the question of BJP getting unnerved arise in this case?. It was a decision of the governor,” he said. The home minister credited Malik for starting the political process in Kashmir. Singh dismissed concerns that the dissolution of the assembly may lead to another round of uncertainty in Kashmir, and said fresh election will be the obvious next step after Wednesday’s decision.